> ABOUT US > Who is Professor Toto? Meet Professor Toto, his friends and his menagerie of animated characters, then discover why he's uniquely qualified to teach your child a foreign language. The professor and his animated friends are the brainchild of François Thibaut, Founder of the renowned Language Workshop for Children and The Thibaut Technique®. That means he professor offers 40 years of experience teaching languages to children. Professor Toto is the only children’s language animation created by a practicing specialist and child-tested in real-life in classrooms, and that’s why it works. Funny and dynamic, Professor Toto and his animated friends are native speakers, so youngsters acquire the right French, Spanish, Italian, Mandarin Chinese, or German pronunciation. Throughout this interactive experience, your child gets to meet Professor Toto's friends: Sophia, an adorable little girl and Professor Toto's exemplary student and Eric; an amusing boy who introduces his entire family and chats about his day. Professor Toto's world is filled with many child-friendly characters: A giraffe driving a school bus, a dancing elephant, a dog cooking dinner, a mouse watching TV, a rhinoceros playing tennis, and lots more! Laugh and learn in Professor Toto's class. Not only is he funny but he teaches with a native speaker accent. Sophia is Professor Toto's new student. Your child will join Professor Toto's class with her! Your child gets to know a young boy named Eric and follows him throughout his day. Children enjoy becoming involved in Eric’s daily routine like brushing his teeth, combing his hair, having breakfast with Mom and Dad, and going to school. 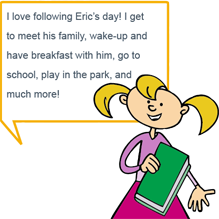 The ‘Eric’s Day’ segment introduces practical, day-to-day vocabulary in a fun, colorful, engaging Professor Toto way. Best of all kids not only absorb their Eric’s Day lesson by watching and listening to the DVD, but also tactually in their Eric’s Day Coloring Book and audibly by hearing their Eric’s Day CD.